What is a 51% attack? What are the possible consequences? If you are familiar with cryptocurrencies, you might have heard about a 51% attack. It is the most dangerous attack against currency pair. It happens when a miner, individual, or group of miners control more than fifty percent of the networks hashrate. If you are interested to know more about 51% attack and its consequences, you can go through the following article. As stated earlier, a 51% Attack in crypto happens when one entity gains more than 51% of the network’s hashrate. It normally happens when the mining pool is too large and the hashrate becomes high due to a growing number of miners’ participation in the same entity. In this condition, there is a possibility that a mining pool might exceed more than 51% of the total network’s hashrate. This condition happened with the most popular coin Bitcoin in 2014. In July 2014, GHash.io the mining pool exceeded 51% network’s hashrate. But the pool owners did not want to take the benefit of this rare condition. 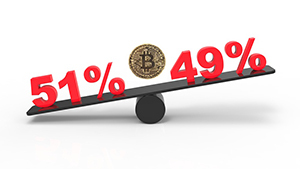 Instead, they preferred to cut themselves down with the promise that they will not exceed 51% hashrate and will limit themselves within 39.99% hashrate. However, some others experienced the same condition in different scenarios. TwoERC-20 and Ethereum based blockchains known as the Shift and Krypton faced a similar condition and suffered from 51% attacks by the malicious miners. These attackers or miners decided to use a mining pool to perform their operation on two different networks. 51% network’s hashrate offers a rich and powerful entity to the miners. They can use plenty of capital in their favor. They get this favorable condition by buying tons of mining rigs. As a result, the entity becomes capable to take over the vast majority of the network’s coin. During the process, they can obliterate the value of the cryptocurrencies by spamming the network chain with transactions. In some diabolical scenarios, 51% attack can be made by the smart contracts. The smart contract will enable them to deposit a huge amount of the funds and they will only be allowed to leave that contract when around sixty percent of the miners will join it. If you would like to leave after sixty percent joined, you can do so once twenty blocks are included to the hardfork chain for the block you are mining. As a result, a new chain will start becoming longer and bigger, and the previous one will not be relevant anymore since sixty percent or even more contracts will be bound to that hardfork blockchain through the smart contract. Also, the miners can earn a reward at the end of the contact. After joining the contracts, the miners will be motivated to get rewards and to take benefits of the large funds they deposited at the time of joining. The 51% attack can cause four different types of consequences. These can be really dangerous. The details of these four types of consequences are the followings. The first consequence is self-mining. The 51% attackers will have the majority to collect the rewards. When a block is mined in the meantime, the attackers will have more chance of gaining control of the next block since the majority will have a great role to decide this. The attackers can mine their own blocks to keep mining on the top of them. They do not need the approval of the network. With 51% majority, they will have the power to cancel transactions. If they do so, it can destroy the network completely by not approving any transaction. The third consequence can really create troubles for blockchain and it needs to be avoided at any cost. Double spending can be dangerous. The process is all about spending the exact amount of coin on numerous transactions simultaneously. The decentralized nature of the blockchain does not support double spending. However, the attackers will have a central power to do so and that can compromise the interest of other miners. If it happens regularly, it will minimize the value of cryptocurrency to zero. When the attackers will be able to create hardfork on the blockchain, they can take the benefit of double spending that takes place during chain splits. They can take control of the new blocks as well. 51% attack gives more power to one entity and enables them to do major changes in the mining. Cryptolume is a cryptocurrency analytics tool that helps users research information on cryptocurrencies in a simple and easy to use platform. It provides quick volume/price information such as 5 minute timeframes, as well as performing as a crypto market scanner for providing alerts on MACD crossovers, RSI status and much more.